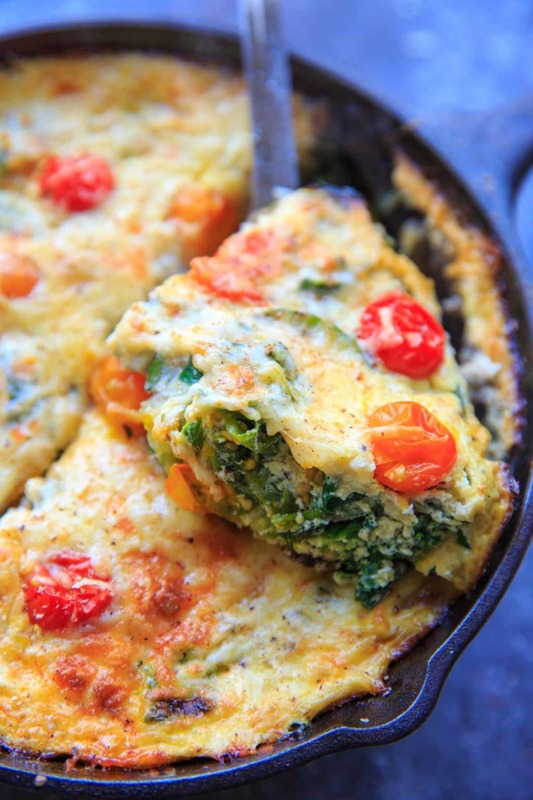 Zucchini Spinach Frittata with Mini Heirloom Tomatoes. Quick and easy delicious meal to whip up for brunch or breakfast for dinner! You know one of the best things to do with your leftover vegetables? I always want to call it a quiche but since I never make it with a crust, I guess I must call it a frittata. Or “crustless quiche” has the same number of syllables. Anyway, as long as you have a few eggs on hand and spices, it’s super easy to use up your vegetables with this dish. This time the vegetables I had on hand just so happened to be zucchini, bell peppers and spinach. The secret is to saute the vegetables with herbs before baking! That makes them tender and evenly seasoned. Add the spinach afterwards because it cooks down so quickly, but be careful it doesn’t spill out the sides. 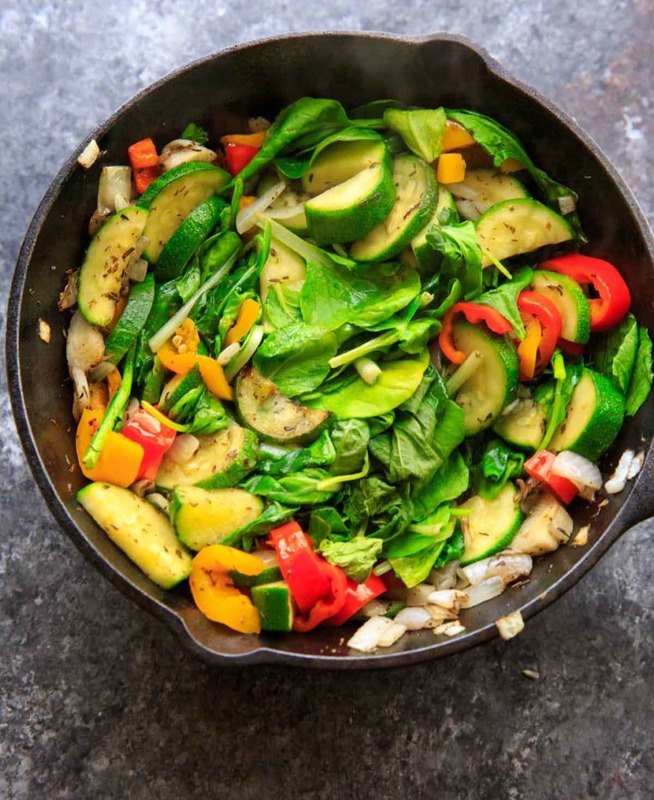 Use a spatula to kind of push it down into the other veggies and it’ll cook down in a minute or two. Then it’s time to add eggs + milk! You can whip them together in a small bowl first if you’d like, or skip that step and just plop the eggs and milk right on top and then use a fork to whisk into the vegetables. It all seems to mix in the same. Baking on the stovetop for a few minutes seems to help the middle cook evenly, so I like to do that before putting it in the oven. …and cheese, if you like. PRO TIP: At the end of baking, turn on the broiler on ‘high’ for 2-3 minutes to brown the cheese and pop the tomatoes. Look at that! 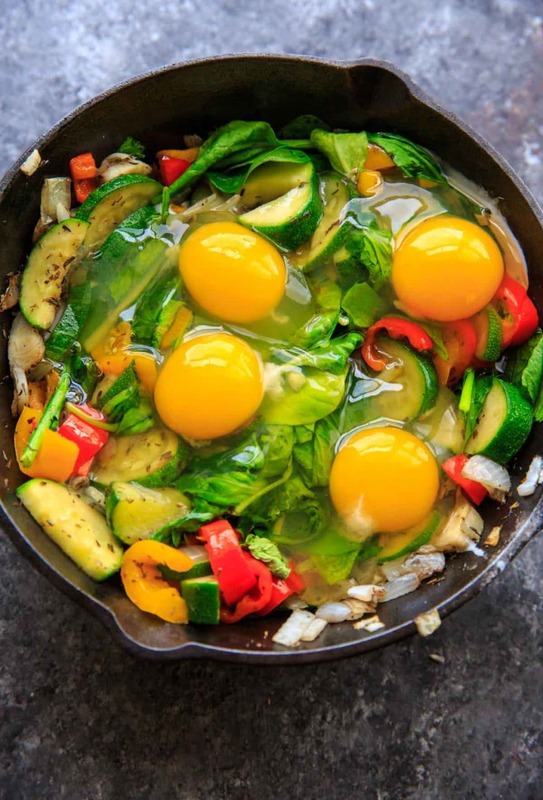 All those veggies are ready to be eaten for breakfast. Or breakfast for dinner, if morning ain’t your thang. 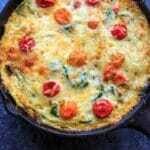 Zucchini Spinach Frittata with Mini Heirloom Tomatoes. 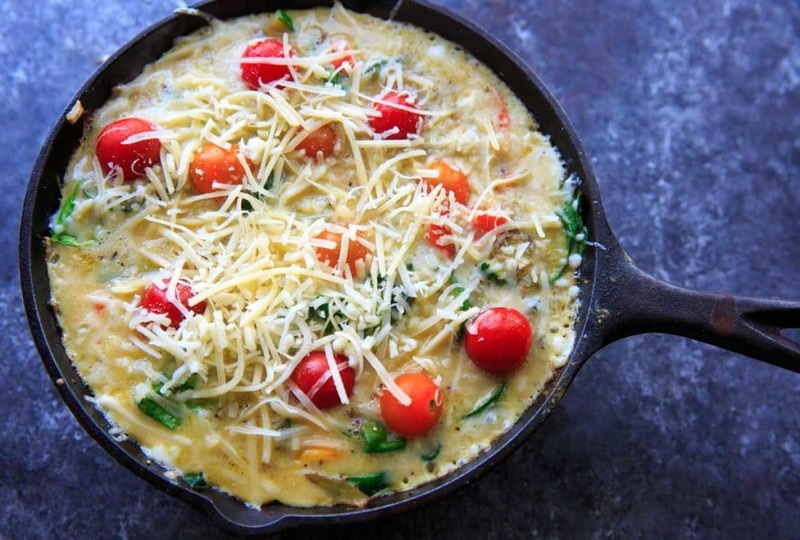 Quick and easy meal to whip up for brunch or breakfast for dinner! Meanwhile, in an 8 inch cast iron skillet (or similar), heat oil over medium-high heat. Add onion and saute for 1-2 minutes until onion is translucent. 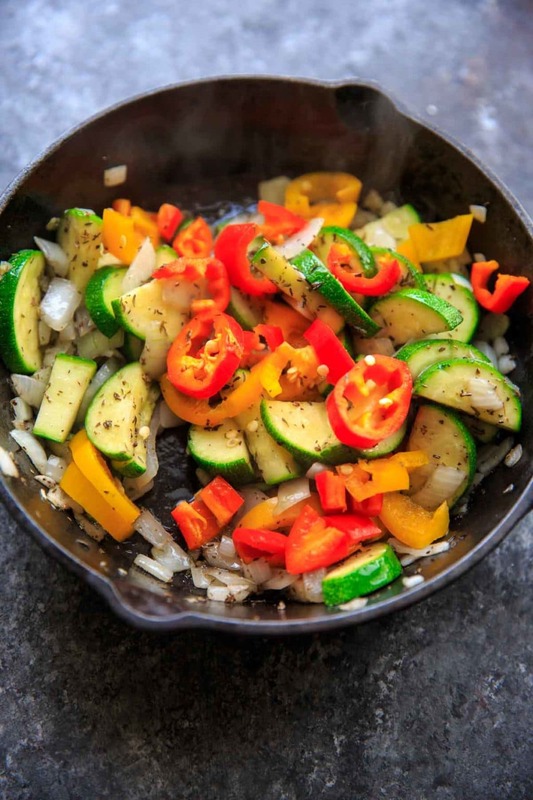 Add chopped zucchini, bell pepper, oregano and thyme and saute for an additional 4-5 minutes or until zucchini is tender. 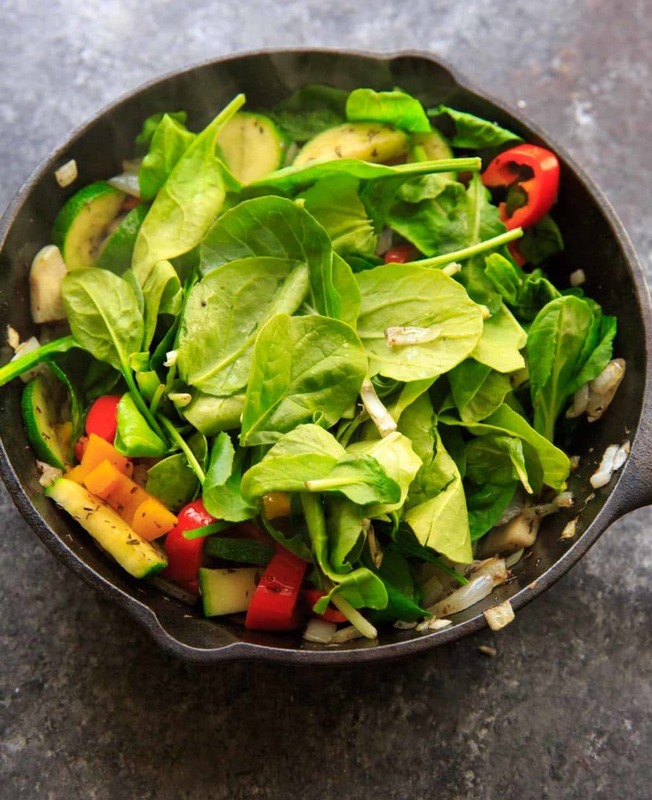 Carefully mix in spinach to vegetables with a spatula while it cooks down. Should only take a minute or so for spinach to cook. In a small bowl, whisk together eggs and milk. Add to vegetable mixture in skillet, and cook on stove for 5 minutes. Top with tomatoes, salt and pepper, and cheese and bake at 400°F for 10-12 minutes until egg is cooked and cheese is melted. Option to turn on high broiler for 2-3 minutes at end to pop the tomatoes and brown the cheese. Sprinkle with nutmeg to finish (optional) and serve! 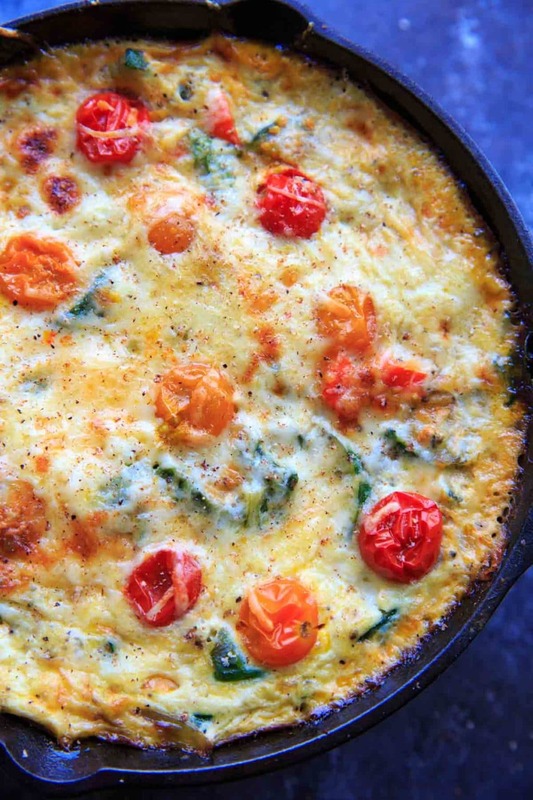 Love how veggie packed this frittata is! That’s my kinda breakfast! I just made something very similar over the weekend, though with twice the zucchini. It’s so tasty and a great way to use up all sorts of produce. Pinned it cause I loved this recipe. 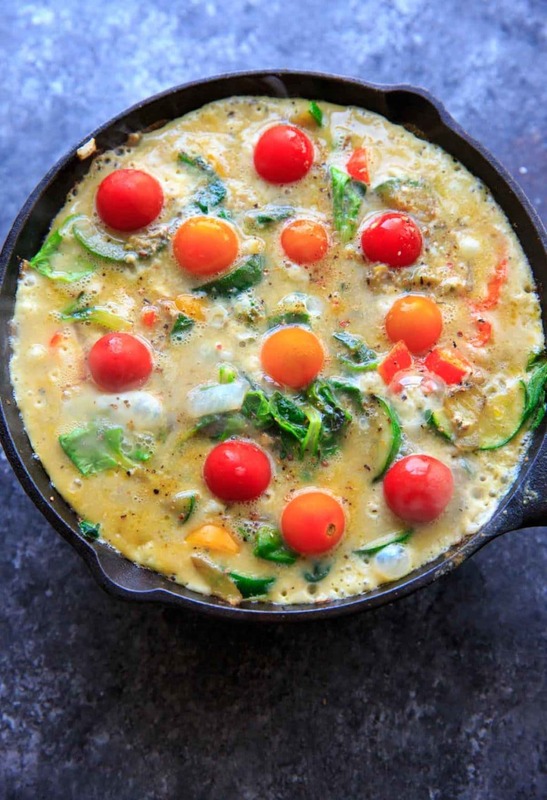 I have an unused frittata pan and I think I will make this recipe very soon. The color combination looks lovely. 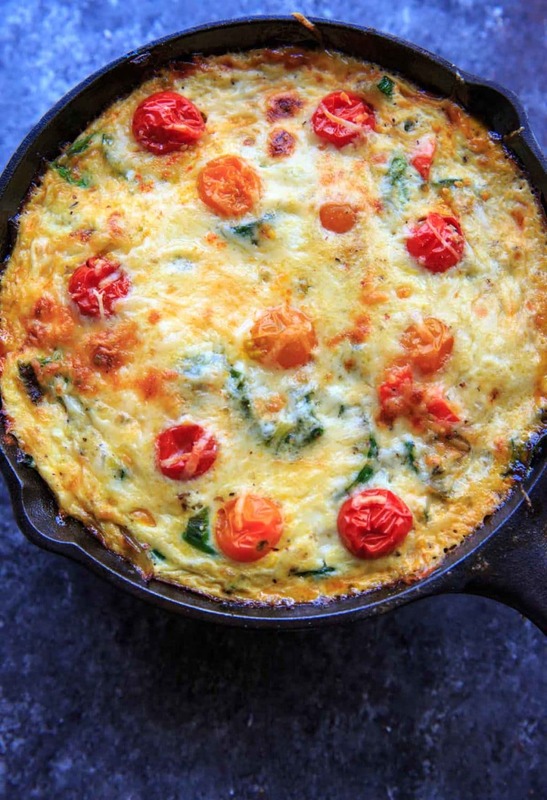 I like cooking frittata this way, I can’t wait to try this at home. This is a beautifully packed recipe full of veggies. I like the idea of sauteing before baking too!